The next in a series of meetings dedicated to the refugee crisis started with an expectation of failure, but ended in success, if the agreement on the text of a declaration could be qualified as success. In the middle of last week, European Commission President Jean-Claude Juncker surprisingly gathered an unusual format of a summit, inviting to Brussels the leaders of the countries on and around the Western Balkans refugee route – Greece, Bulgaria, Romania, Serbia, Albania, Macedonia, Croatia, Slovenia, Hungary, Germany, and Austria. Turkey, despite being a decisive factor both in the problem and in finding a solution, was not invited. Many were wondering why the Albanian Prime Minister was invited, at which the Commission replied that Albania is part of the region as well and although there is no data as of today that it could become a branch-off of the Balkan route the map showed it would be prudent to invite it. A similar meeting was demanded as early as the summer by Serbian First Deputy Prime Minister and Minister of Foreign Affairs Ivica Dačić, who sent sharp criticism towards Bulgaria and Hungary for not participating in this year’s Berlin process summit, which was also dedicated to the migrant-refugee problem. And these states, Mr Dačić said then, also have a role. During the meeting in Vienna, he was outraged that the EU was planning a summit, dedicated to the problems the countries of the Western Balkans states are facing because of the ever-growing refugee influx, for as late as October. However, the October meeting was not a summit, but a meeting at a high level, meaning with the participation of ministers and high-ranking representatives. Moreover, it was not dedicated solely to the Western Balkans countries, but the states of the Eastern-Mediterranean route as well. The meeting of October 9th resulted in a declaration with a wide scope. In it, there is a commitment to aid states that are the first affected by the refugee flow – Turkey, Jordan, and Lebanon. The existence of transit-countries is admitted with a special chapter in the declaration dedicated on how to aid them. Namely, by the provision of immediate humanitarian aid in the form of food, shelter, healthcare, psychological and social aid, protection, water, and sanitation to all those transiting. Enhancement of reception and accommodation facilities, exchange of information. A core element of this part of the declaration was the commitment to work on avoiding neighbour tension and battle against xenophobia. Another key element was the exchange of information and regional coordination. At that meeting in Luxembourg, participants agreed to fight organised crime and human trafficking. The meeting in question was held in between the consecutive meeting of ministers of Justice and Home Affairs of the EU, who voted in important changes in European legislation regarding refugees and migrants, and the next in line EU summit, which, alas, ended without producing much of a result. Just ten days later, this Western Balkans summit was called, which seems to have set the beginning of a mechanism of cooperation between the countries in the region, regardless of their EU membership status, for experience teaches that the lack of proper dialogue is typical for both EU and non-EU states. This, in itself, speaks bad about the EU, but this is a subject for another discussion. In the days before the meeting tension between states of the Western Balkans route rose again after Hungary, obviously as an answer to the “achievements” of the October 15th summit in Brussels, tightened its border control at the border with Croatia, threatening to do the same with Slovenia in an attempt to isolate itself from the route. Croatia, which is in the heat of a campaign for the parliamentary elections on November 8th, found itself again in a situation of exchanging accusations with Serbia and Slovenia. While accusing Serbia for bringing in too many refugees at the border, whom it cannot not process fast enough, Slovenia was complaining that Croatia is transporting refugees too fast and at too large a number without sending prior notice. Zagreb claimed they are working well with Ljubljana and that there is a negotiated corridor. Ljubljana, however denied it and even accused Croatia of purposefully transporting refugees to spots, where the Slovenians were not expecting them. This is how we got to the footage of refugees swimming through the icy waters of the river Sutla that shocked the European Commission President Jean-Claude Juncker and German Chancellor Angela Merkel. 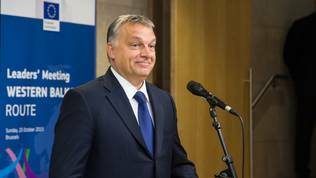 Before the start of the meeting, Hungarian PM Victor Orbán, in an unusual manner, faced journalists and asked playfully “Any questions?”, which spurred laughter among the colleagues. He stated that he was present at the meeting solely as an observer, for Hungary no longer sees itself as part of the Western Balkans route. He was ready to help his colleagues with advice if they so wished. However, when asked whether he would advise his colleagues to also build walls, he said he was not being paid to give advice to others. His expectation was that at this meeting an end would be put to the open-door policy and invitations that violate the Schengen agreement. Also, that Schengen states on the route will follow this “international agreement” as he called it. “That's just an opinion of an observer anyway”, concluded the Hungarian PM, with that playful look again. Croatian Prime Minister Zoran Milanović, who lost his voice ten days ago at the European Council, was vocal enough on Sunday evening in saying that he was not there to make any commitments, just to participate in a constructive dialogue. He pointed out that a very important interlocutor was absent at the meeting – Turkey. He reminded that none of what is being done had any meaning, for Croatia is the fourth link in the chain. By the time the refugees reach Croatia, three states have broken the rules already. Mr Milanović was softer towards Greece this time by saying he understands that the state could not cope on its own. “It is clear that Greece has operation problems and cannot cope. Nobody can. Not Slovenia, nor others. This has nothing to do with Schengen. This is an improvisation. This is a slight fire. When there is a fire you do not follow road signs. You just drive”, he said, but pointed out once more that he had no idea why the problem at the Turkish-Greek border was not being dealt with. He underlined in his slightly arrogant style that he did come, regardless of being in the middle of an election campaign, to demonstrate constructivism. 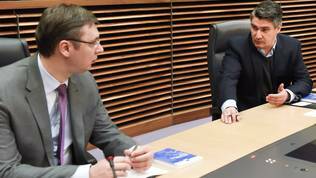 Unlike him, Serbian PM Aleksandar Vučić played his role of the most-constructive leader on the Balkans brilliantly. In a resigned tone of voice and untypical openness to journalists, in perfect English with an American accent, he stated that he expected a common European solution from this meeting. 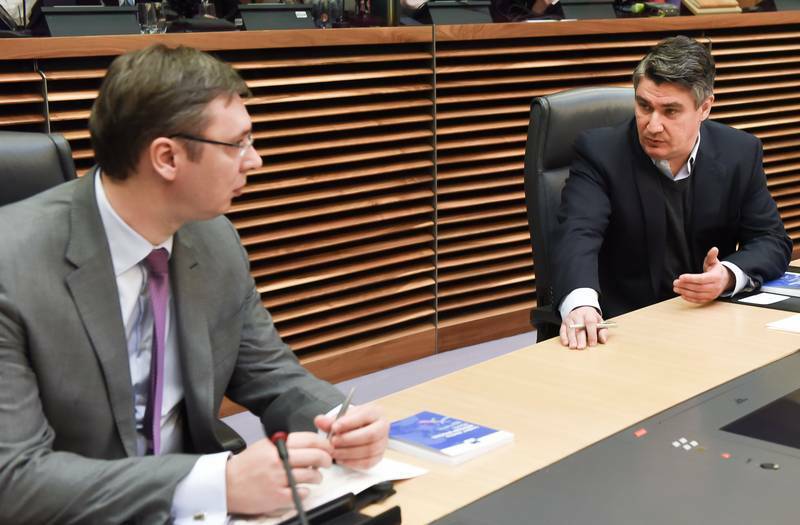 He said that Serbia was ready to accept its quota, as all the others, no matter that it it is not part of the EU. The big question is, however, what is to be done with the hundreds of thousands of refugees. The former minister of information in the government of Slobodan Milošević spoke in front of journalists twice. The first time upon entering the meeting building and the second time before the dinner that ran until well after midnight. He discounted any parallels between Serbia and Germany by saying the Serbia is a transit state only. It does not take responsibility for the care for tens of thousands of refugees forever. In his opinion, the meeting would not achieve much, but at least “we had a chance to speak to each other, to hear each other and to learn a bit about the problems that all the others are facing”, he said, as if completely oblivious up until then that there are other countries with problems similar to his, despite the constant media shootouts with neighbours along the Balkan route. If Croatia is prepared to take in 2000 people under the quota system, then Serbia is ready to take in 3000, according to population size and other criteria used in the quota system, agreed on in late September. According to him, however, the most important question is what is to be done with those, who do not wish to stay in Serbia. “Put them to jail?”, he asked, raising hands helplessly. The Bulgarian Prime Minister was also quite cross that right at the day that Bulgaria was having its local elections and a referendum for introducing electronic voting he was called “dramatically” to Brussels. He was voiced an objection only to a text in the draft declaration, which urges states along the route to take out loans from international financial institutions to finance measures, relating to the refugees. “I have always supported the strict following of the Maastricht criteria – up to 3% budget deficit, foreign debt not exceeding 60%. What is being offered, some states might be tempted to renew all of their military equipment, for example, border equipment and all the rest with loans and raise up their deficit, and a year from now we’ll go back to talking about a financial crisis. 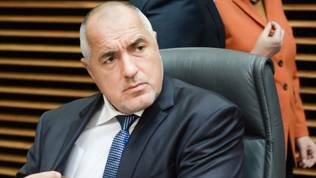 This is why I am against”, explained Mr Borissov several days after EUROSTAT revised its data on Bulgaria’s budget deficit for 2014 upward to 5.8% of GDP, which could prove to be grounds enough for opening a procedure on excessive deficit. The 2016 draft budget, presented a day after his statement provides for a budget deficit of 3% of GDP. 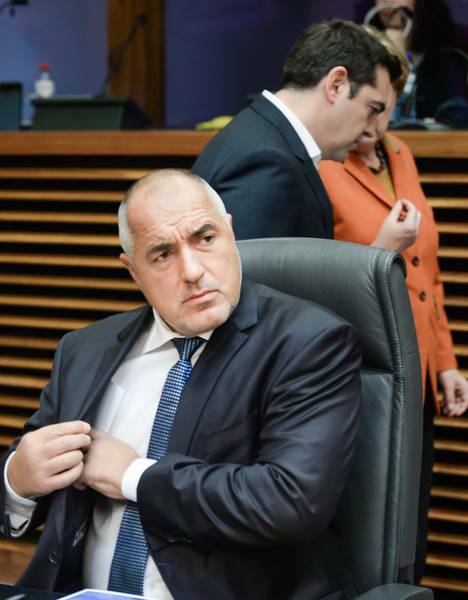 The Bulgarian PM further said that Bulgaria wished to be a part of a European solution. “We do not wish to be individualists, but decisions need to be made today”, he said between the first session and the dinner. At the background of the moderate pessimism, coming from the PMs of Hungary, Croatia, Bulgaria, and Serbia, Slovenian Prime Minister Miro Cerar painted a catastrophic scenario. He stated that if a solution to the problem was not found, the EU itself would break apart. Also in very good English, Mr Cerar explained that Slovenia was the smallest country along the route with its population of 2 million. Just in the last ten days, over 60 thousand people had entered the country with 13 000 entering in a single day. This is the equivalent, he explained, of half a million entering Germany in a day. Although Slovenia strives to protect the border (which is also a Schengen one) and is trying to have a humane attitude, it will not last too long. “And if we don’t do everything together, this is the beginning of the end of EU and Europe as such”, he said and did not miss the opportunity to accuse Croatia again of pushing people at the borders and into icy rivers, as well as for a total lack of communication. Let’s start talking and cooperating! In the first hour of October 26th, the leaders of countries from the region shook hands over a joint declaration of 17 points, which steps on several key elements – constant exchange of information and effective cooperation, limitation of secondary mobility, support for sheltering and resting of refugees, joint management of migratory flows, border policing, battling trafficking. Sounds familiar, right? This has been present in one form or another in previous documents as well. In the declaration from the October 25th meeting, region countries commit to talking to each other, having already started appointing liaison officers. Leaders have committed to doing that within 24 hours. A Commission spokesperson announced at noon on Monday that the process had already started. States along the route will exchange information daily and will coordinate the movements of refugees, so that efforts can be directed in a timely fashion towards the building shelters and organising the supply of food, water and sanitary supplies. Moreover, states commit to not stimulating refugees to pass into another state without informing them in advance. In the declaration, there is a commitment for the building of larger-capacity centres, which would mean refugees to stay in a country longer. Greece, for example, committed to widening its centre capacity by 30 000 people and another 20 000 are to be sheltered by individual citizens and families. Another 50 000 are to be distributed among states of the Western Balkans. Whether this will be a voluntary process, by quota principle, or another one is not yet clear. The declaration, indeed, urges affected countries to look for financial aid from international organisations, but it expressly says this is voluntary. Although there is not yet an agreement at the EU level for common border protection, this will be tested to some degree in the Western Balkans region. Frontex will be working at the Serbian-Croatian border. 400 policemen will be distributed along the Slovenian-Croatian border as well. The European border agency will be reinforced at the border between Bulgaria and Turkey, too. What was agreed by the region leaders will be scrutinised and controlled every week. The Commission demanded all the time before the summit that states along the route should take advantage of two European mechanisms. The first one is for civic protection, which Croatia finally took advantage of by asking early Monday morning for material aid in the form of winter tents, beds, mattresses, blankets, and sanitary equipment. Up until now the Croatian PM was boasting that Croatia was dealing fine by itself and needed no outside assistance. Jean-Claude Juncker was visibly glad of what was achieved when he appeared at the end of the meeting for a joint press conference with German Chancellor Angela Merkel. He pointed exactly at the fact that Balkan states had started talking to each other, as they themselves noted at the end. 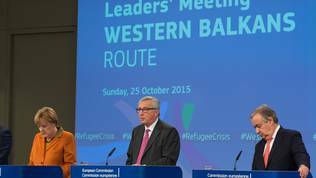 Mr Juncker sent a strong message to refugees to get registered. “No registration, no rights”, he said and stressed again that closing borders was no solution. A day before the meeting Bulgaria, Romania, and Serbia agreed that if Germany and Austria closed their borders, they would reciprocate. Asked about this before the meeting Aleksandar Vučić replied: “And what do you expect us to do – turn into a buffer zone?”. The big task, however, continues to be implementation. 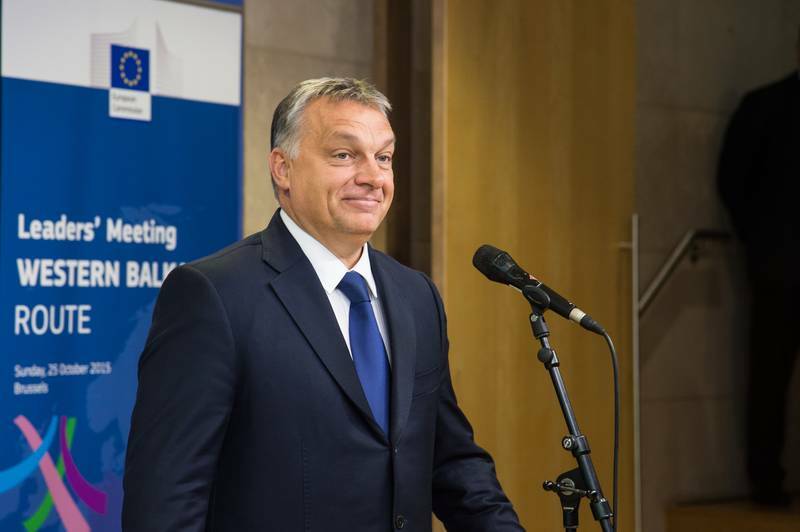 Hungarian PM continued to claim even after the meeting that Hungary was just an observer. However, Hungary will nominate a contact point to “facilitate coordinated action on immigration, in accordance with the decisions of the leaders at the meeting on Sunday”, is said in a message from the Hungarian government. Other than that, Hungary will continue to guard its green border as it is currently doing. So far, reactions from the European Parliament are few, probably because on Tuesday morning Mr Juncker and Donald Tusk will be answering MEPs about the results of the October European Council. According to EPP group leader Manfred Weber (Germany), the outcome of the Sunday meeting is positive. “This plan must be implemented. It cannot remain on paper only. 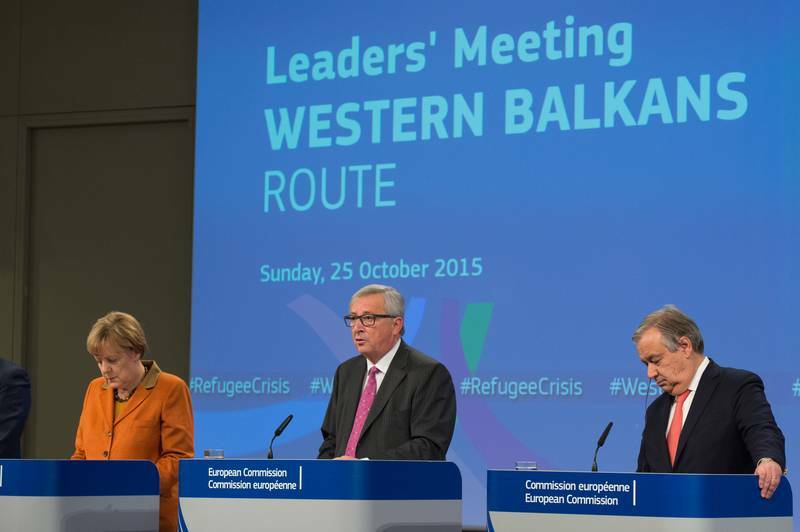 Order must be restored on the Balkans route and refugee flows must be channelled”, he said. "Europe should not forget its responsibility vis-à-vis the Western Balkans and must support the humanitarian efforts of these countries through immediate financial assistance", said the leader of the group of Socialists and Democrats Gianni Pittella (Italy). The meeting, however, will leave a bitter taste in the mouth of European Council President Donald Tusk. During the press conference after the end of the EU summit on October 15th, there was a misunderstanding whether he is to answer a question or Jean-Claude Juncker. Then the former Luxembourg PM said “You are the boss!”. On Sunday evening, however, the former Polish PM was not the boss. His frustration at the fact that such a meeting is organised by the Commission showed through before the meeting when he said that, regardless of the elections in Poland (which were lost by his party), he came because of the gravity of the situation. “I heard doubts and controversies from capitals about the format, but since our Balkan friends feel they are under a real threat I will not focus on formalities and procedures but on how to help them”, he said. Regarding criticism on having the meeting in this format, Angela Merkel stated that unusual times call for unusual formats, which is far from an example of European unity. One of the positive sides to this format is that states outside the EU, especially the ones with ambitions to one day become full members, see how the Union really works. They also learn to communicate with journalists. Not all leaders spoke to journalists and even fewer spoke in English. It was noted, however, that the Bulgarian PM left right after he was asked a question in English, while Macedonian President Gjorge Ivanov used an interpreter.